There are many fun theories regarding the origin of the name “Monkey Bread” – one being the resemblance the loaf has to a monkey-puzzle tree. There are also many different names for this type of dessert, breakfast, or snack, such as: bubble loaf, pull-apart, pluck-it cake, Christmas morning delights, sticky bread… the list goes on. Not only are there many different names, there are also many different recipe variations! Most are familiar with the classic cinnamon version, but Monkey Bread can be savory too! A popular take in The South simply consists of butter, and many add cheese and herbs to create a tasty table bread! The name Monkey Bread was also popularized by many notable individuals, and recipes of all types continue to appear in a multitude of cookbooks and food magazines, some dating back to the early ’50s! For Bridgford, it’s been a family tradition for decades – which we’ve now developed as a retail product, to share the love with customers like you! Want to make it “from scratch”? Try this cinnamon monkey bread recipe! 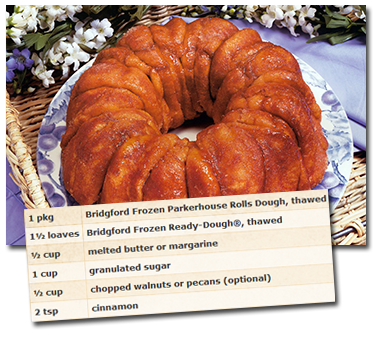 Use Bridgford Parkerhouse Style Roll Dough, Bridgford White Roll Dough, or Bridgford Ready-Dough® to make your own Monkey Bread! For more history and fun facts on Monkey Bread, click the links below!